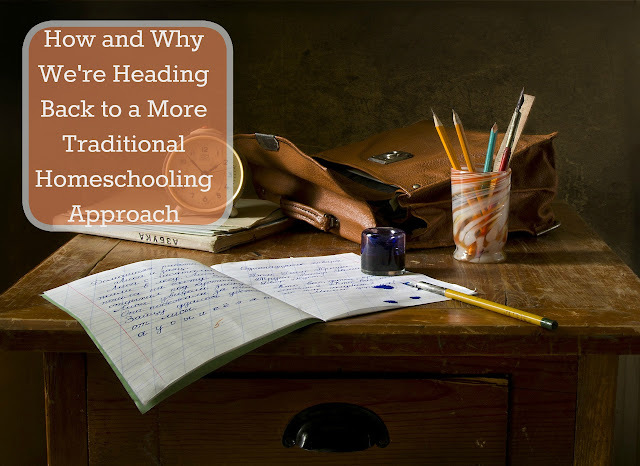 We are going back to a more traditional way of homeschooling rather than using the unschooling method, for now anyway. I'm sure it could change at any point! My oldest has been complaining that it's boring "just playing" all day and has been wanting me to plan lessons again or as he put it "when are you going to start teaching us stuff again?" So, I spent part of my day yesterday writing up a rough outline of what I'd like to accomplish this week. A huge part of why we jumped into unschooling was that the boys didn't appear to like anything I planned and I just couldn't take the complaining anymore. However, after almost a month of unschooling they are complaining that they are bored all the time and they bicker and fight more just to have something to do. I've decided if we're going to be plagued with complaints and fights anyway we might as well get some school stuff done too. Today the older boys did a lesson in McRuffy for math. Ian was a bit stumped at first, mostly because he didn't trust himself to remember how to do it all but he did. Alec doesn't seem to like McRuffy at all and I think it's just not quite challenging enough for him so today I had him skip ahead about 4 lessons and we learned about 10's and 1's. He seemed to enjoy it and had no problem adding two digit numbers at all, even though I've never really taught it to him. We've also made a deal where they don't have to do ALL the problems. If they pick half of them on a page and get them all correct they can skip the rest. They love this idea; what better motivator than less work right? I'm happy to say they both got them all right and math went pretty quickly because of it. Alec conducted his own science experiment. He had some invisible ink he had gotten a while ago and he wanted to see if he could get it to reappear after it disappeared by heating up using my hair dryer, like you can with some invisible inks. He was hoping to write a secret message on his painting to his cousin. But even after using the hair dryer on high we couldn't get any color to show back up. He was so bummed. While he was doing that Ian finished watching his Alaska movie called Alaska's inside passage. He had watched a little over half of it a week ago and I wasn't sure if he was going to bother finishing it or not since it's all about the extreme southeastern tip of Alaska and he mostly is focusing on the Yukon region for his geography fair/report, but he assured me he did want to finish it and that it was very interesting. started reading James and the Giant Peach this morning. My plan was to only read the first two chapters but they like it so much already that every time I tried to stop and put it down they begged me to read just one more chapter. I finally stopped us on chapter 6! This is one book I remember quite vividly from when I was a kid. I always loved it and hoped that they would too. I also decided to start working with Evan more regularly on reading. I have been reading a lot of books that insist we sell our kids short in teaching them to read by giving them meaningless books with few words that are uninspiring. So I decided to pull a book from his pile of library books and have him try reading No, David! with me. We took a picture walk to predict what the story was about and then we tried reading it. I helped when needed but for the most part tried to have him figure it out on his own. It's such a fine line between challenging him and overwhelming him. He complained through the whole thing but then when I pointed out to him at the end that he read most of it on his own he just beamed me a smile. Hopefully, the more we do it the less he'll complain. I don't want to force him to read but he loves books so much and I know once he starts to "get" it he'll just take off. His favorite books are chapter books already! Over the weekend Alec planted the pineapple top in the hopes of growing a bromiliad. So far it looks good but I can't help thinking about the last time we tried this experiment. For today I had Alec work on making a list of animals found in the rain forest. He got to type it up on the computer. While using the computer was new and challenging he got quite a bit done. He has so many animals listed we'll never be able to fit them all on his board so I told him to start thinking about which ones he wanted to have pictures of and which ones we'll keep as just words/lists. Evan really wanted to write that the capital of Florida was Tallahassee and since that's a fact that he not only remembered but really wanted on his board I had him write it. He complained a bit at first, but worked so hard. It came out great. Ian had to wait for Alec to finish on the computer because he wanted to type up a list of jobs that people in the Alaskan wild have. He talked about fur trapping, the kinds of animals they trap, fishing and all the different ways they catch fish, gold mining and a bit of the history too. I taught him how to cut and paste and search for information on the Internet. We headed out for our trampoline class. Evan decided to try the class again this round and all three boys were extra excited today since their cousin was also starting the class today. I think Evan forgot just how tiring it was to jump for two hours; even with frequent breaks throughout the class he almost fell asleep on the way to the library and science class. Today was the last mad science class and the boys were real hopeful it was going to be about water today. It ended up being about the center of gravity so they were pretty bummed. They weren't able to tell me all that much about the center of gravity either so I'm not entirely sure what they did for that hour but I do know they came home with this great experiment kit to practice finding the center of gravity.